Nine Nebraska Business students achieved medallions for the first semester of the program. 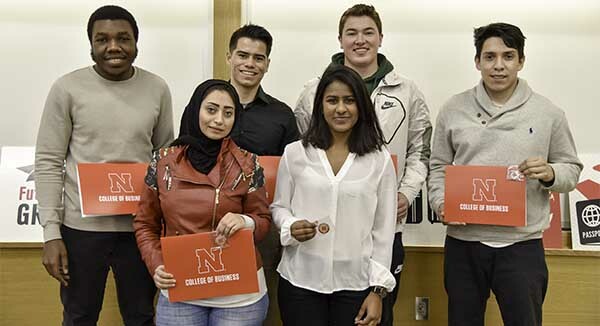 Nine students at the University of Nebraska–Lincoln celebrated the first year of the International Business Medallion Program by taking home medals similar to Olympic athletes. Although, in the Medallion Program, students do not compete against one another, but through achieving points through a system that measures academic achievement and participation in activities that build soft skills such as interpersonal communication skills and critical thinking. The International Business Program at the College of Business recognized the first group of students to achieve medallions with a ceremony in Howard L. Hawks Hall on November 30. Open to all business majors, students earn medallions at four levels: bronze, silver, gold and platinum. Students build points in three distinct categories: career building, global citizenship and well-being. Structured as a multi-year program, students can begin earning points their freshman year. Amy Lester, international business program coordinator, found it inspiring to see students take initiative and get involved, showing concerted effort to make their time here matter. She signified the benefits of the program, giving students the opportunity to aggregate their undergraduate experience and quantify them in a standardized manner through different levels. “We want to recognize students’ efforts for being involved in their student organizations, taking care of themselves mentally and physically, connecting with potential employers, or building global competencies by attending cultural events. Having a way to categorize those holistic experiences is another way to build their personal brand both now and for the future,” said Lester. Joey Osbron talks about his experiences in the medallion program with Dr. Kalu Osiri. With the program being new to the college, no student has yet to achieve gold or platinum status, but several already earned silver medallion status. As one of those silver medallion recipients, Joey Osbron, a junior international business major from Valencia, California, faced challenges with motivation and maintaining consistency, but found the program to be rewarding and worth the effort. Introduced to the program from her time in the Employment Readiness Program for international students, Meena Pannirselvam, a junior finance major from Puchong, Malaysia, found the criteria of the program beneficial to her experience at Nebraska. The program also celebrated the international business seniors graduating in December. Dr. Kalu Osiri, international business program director and associate professor of practice in management, left the seniors with words of gratitude. “You all are really special to us here in the International Business Program, and to the college as well. Whether it is the major, the global leadership minor, or what we do in terms of study abroad, it is one of our points of excellence in the College of Business. You should know that, because you are part of something special,” said Osiri. To learn more information on the International Business Program, visit: https://business.unl.edu/ib.